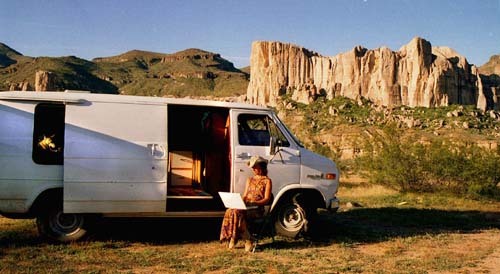 Lorraine Chittock writing in the Arrastra Mountain Wilderness, Arizona. 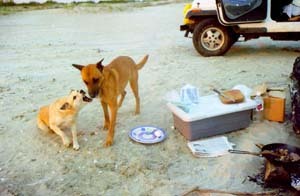 DOG defending food from Bruiser at Holly Beach, Louisiana. 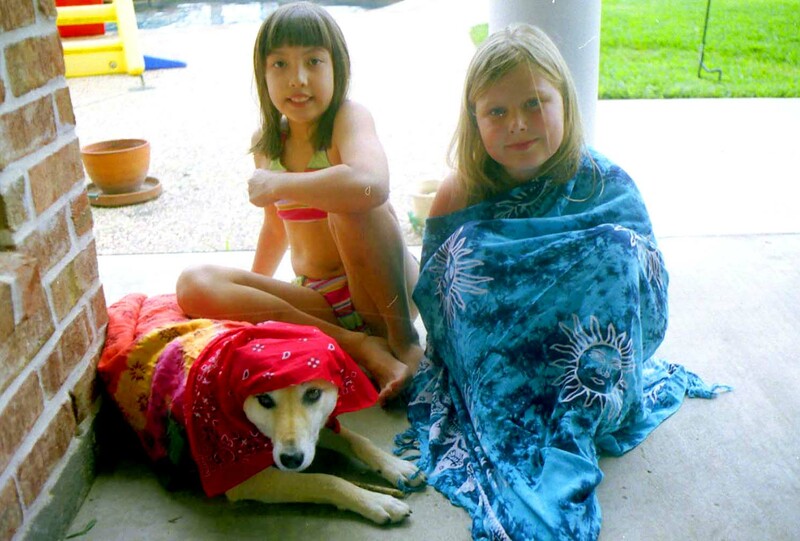 DOG and Bruiser submitted to hours of dress-up for Gaby (in blue) and her neighbour in Houston, Texas. 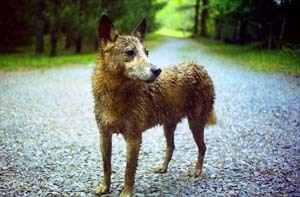 DOG in a more natural moment after emerging from a mud puddle on the Pigott estate, Ellijay, Georgia. 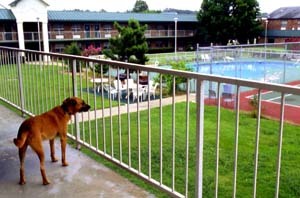 Bruiser watching longingly from the balcony of a hotel in Arkansas. 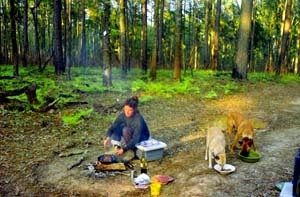 Cooking dinner at the Sam Houston National Forest, Houston, Texas. DOG sniffing the breeze, Arizona City, Arizona. 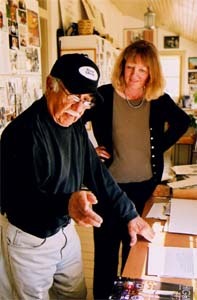 Pedro Gullaro, photographer extrodinaire and Dixie, Florence, Arizona. Feeding time, just outside Phoenix, Arizona. 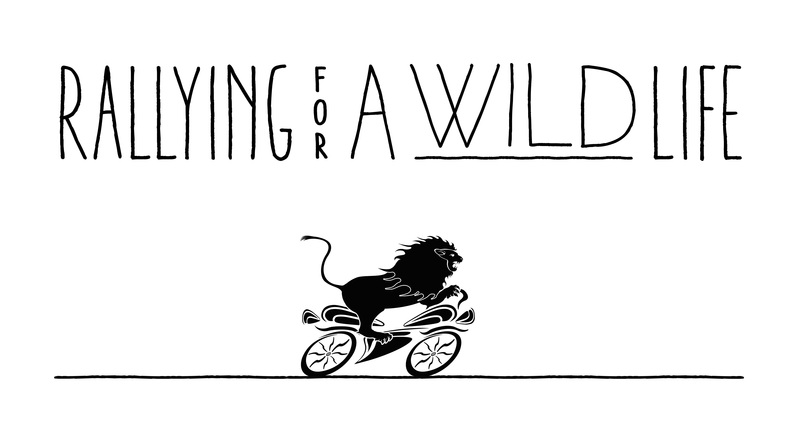 Venturing further south into Central America will take a different kind of assistance. Gas. Prices are soaring. My method for travelling in this 15 mpg van is to move slowly, and stay in one place for long periods of time. This suits me and my writing. Border fees and bribes. The price of travelling through developing countries. Food will be much cheaper in Central America (and fresher), but though I'm petite, I have a good appetite. The dogs will continue on their diet of dry food with daily servings of fresh meat. I'll need a satellite phone so I can access email as opposed to searching aimlessly for elusive internet cafe's in remote villages. This would also make it possible to send updates or have a blog site. If you just happen to have an extra satelite phone, or have connections with a company where I might get one in exchange for publicity, please let me know. Digital camera. The digital age is here, and I'm eager to join it! Again, if you have an extra 35mm digital camera with a good amount of pixels which can be used for magazine work, or have connections with a company where I might get one in exchange for publicity, I'd appreciate your contacts. There's a reason my ex-surveillance vehicle was $750. It's 20 years old and though this 1985 Chevy with a 350 V-8 engine runs great, it does have 127,000 miles on it, and will inevitably need work. Now for the dogs. 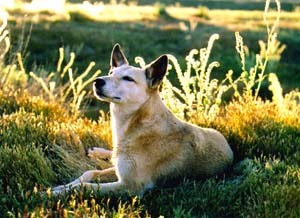 First of all, if I thought either DOG or Bruiser weren't enjoying themselves, I wouldn't continue with this adventure. Of course. But they do. What a life for a dog, to rarely be on a lead, and as you can see from the pictures, only wearing their collars in cities! 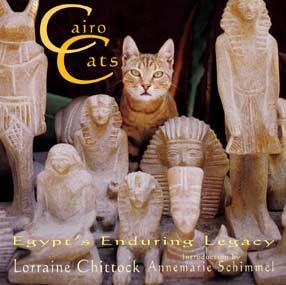 Their diet consists of dry food with daily servings of fresh meat. When I make stir-fry, I often cook an extra portions for them to share so they can have their vegetable, even though DOG isn't crazy about the vegetables, preferring meat or milk instead. Of course. I keep about five cans of emergency dog food rations in the van in case we run out of meat, (I call it junk food, and DOG loves it...) but that rarely happens, much to DOG's dismay. They get monthly doses of Heartworm medicine and very, very occasionally I spray sections of their bodies with Frontline. The fleas in the US are not nearly so prevalent as they were in Kenya, thank goodness. They had their last rabies shots in July 2004, so they're good for another two years. Though my Kenyan dogs are extremely healthy and robust, accidents do happen. Two and a half years ago, a spitting cobra sprayed venom into DOG's left eye. For three weeks, I put drops in her eye throughout the day, and twice in the night too. The eye healed. But now this eye is prone to infection from high winds as well as tiny abrasions from running through tall grasses. 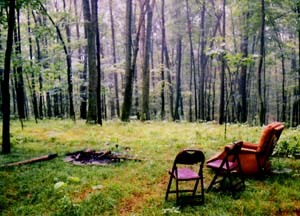 Bruiser got tick fever in 2004 and the bill came to almost $500. Vets will be less expensive in Central America, but more remote and I'd like to add to my stock of medicines that I keep in stock. I currently have anti-biotics and medicine for snake bites and dog aspirin. Medical for me. It's now been over two years since I've been sick with ANYTHING. Except hayfever and I don't think that counts. This lifestyle must suit me! However, again, accidents can happen and though medical costs will be cheaper in Central America, they will cost. Montezuma's Revenge will be sure to strike at some point! If contributing to any of these areas in any way is something you'd like to do so I can get on with the business of finishing writing my book, On a Mission from DOG, please send me a note. I very much appreciate all your support!